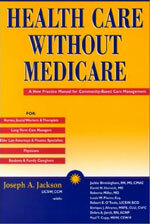 In Staying Home, Staying Well: A Home Care Planning Guide, Joseph A. Jackson describes the seven basic steps to establishing a successful home care plan. Jackson’s model blends care planning and resource planning in a simple, easy-to-follow course of action. Jackson draws on years of experience in arranging and managing home health care to offer consumers, professionals and providers a valuable tool in helping home care clients achieve their most-often stated goals—to remain independent at home and to preserve their life savings. You may download a sample of Staying Home, Staying Well. These documents are in Adobe Acrobat PDF format. If you do not have Adobe Acrobat go to the Adobe Corporation to download a free copy of the Acobat PDF reader.